In the course of selling my camera gear, I’ve encountered no small number of scammers. I generally ignore them and get on with the business of selling, packaging, and sending out the various bits that I’m trying to offload. Every now and then though, you encounter a persistent and annoying scammer, and one that has the audacity to win one of my ebay auctions (at the expense of legitimate buyers) and then start doggedly insisting on completing the transaction outside of eBay. Thankfully, I wasn’t born yesterday, and after stalling for several days while reporting the user to the relevant (hard to find) customer support emails on ebay and paypal respectively, I finally sent them a package based on the promise that they’d transfer money to my bank account on receipt of a tracking number. Had I received any money I might have felt bad, but when scammers send emails promising payment from “Bank of America” full of spelling and grammatical errors, signed by the CEO himself, then it hardly came as a surprise that no money was transferred (they didn’t even bother to spoof the email header to match the Bank of America domain name). They did, to their credit, provide a phone number I could call for reassurance and when I called much assurance was given, although curiously the ‘bank manager’ declined to divulge any details about what city or state their branch was located, the current time of day, the weather, or the colour of his tie. Recently I’ve been feeling the warm and fuzzies from Christmas dinners with good friends, and the sensation of a newborn baby falling asleep on my chest, but my festive season delight was topped off earlier today when I received a string of angry emails from my scammer friend who had just returned from the post office expecting to pick up a Nikon D800 digital camera, but instead collecting a large box full of flour and paying a considerable customs duty on its declared value of €1000. 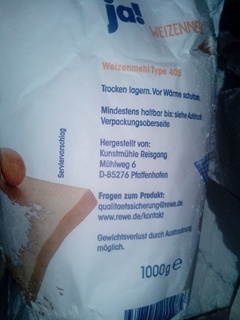 I replied saying that since they hadn’t transferred any money, they should be thanking me, since 1kg of flour in Germany can cost as much as 35 cents. I have so far not received a reply.